Spring, summer, fall, winter. It doens't matter what season it is for a watch to be in season. Honestly, my thinking is that a watch is the hottest accessory year-round. 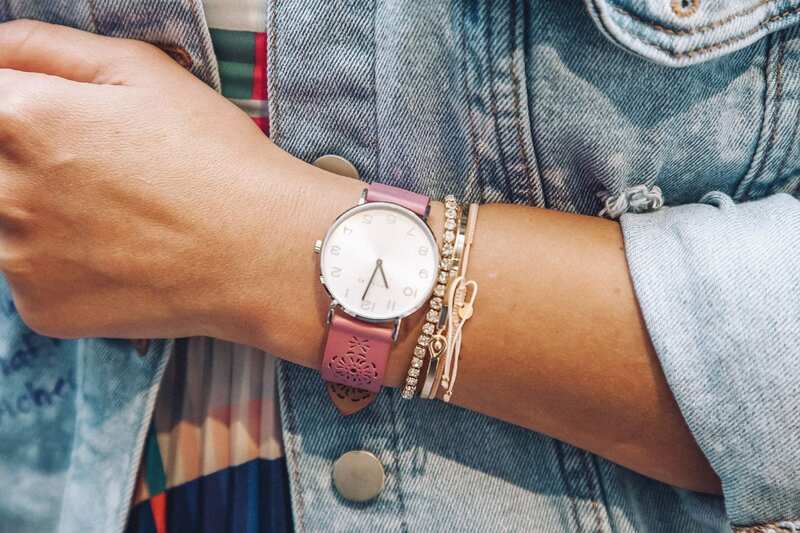 The cutest watch gives your entire outfit a little extra chic-ness, not to mention a bit of color to play with throughout your outfit. The new Coach Watches collection was specifically created for Macy's and I am all about the line-up. The styles are so fun, and whimsical in nature, showing off the creativity that is Coach, a brand that has been a fashion icon for decades. Every single watch in this collection is one I want to own, but I just love the gorgeous color of this one. This gorgeous lilac/blush leather strap is one of my favorite colors. It's so feminine and just plain adorable. The strap is 36 mm, so it will fit most wrists. Not to mention this strap detailing is unlike any other strap I've ever seen, which I love. Being unique and having pieces that are different to the norm is what I live for because uniqueness is what makes me expand on my fashion sense. I love stacking this watch with other bracelets, and making "arm candy" come to life. Ever since I was in middle school, I always turned to Coach for modern luxury. There was something so iconic about the brand then, and it's even more so nowadays. Because Coach has been in the fashion world for so long, they have seen the change in the space, and adapted to it over the decades. This watch collection is privy to this, without a doubt, as no one has done beautiful straps quite like this. The craftsmanship behind these is well thought out, and makes for a gorgeous gift for someone special in your life. What's your favorite everyday accessory?